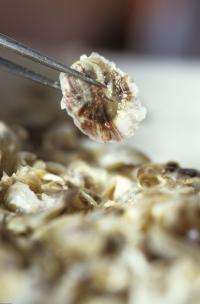 Researchers at Oregon State University have definitively linked an increase in ocean acidification to the collapse of oyster seed production at a commercial oyster hatchery in Oregon, where larval growth had declined to a level considered by the owners to be "non-economically viable." A previous study co-authored by Hales found the water that is being upwelled in the Pacific Ocean off the Oregon coast has been kept at depth away from the surface for about 50 years  meaning it was last exposed to the atmosphere a half-century ago, when carbon dioxide levels were much lower. "Since atmospheric CO2 levels have risen significantly in the past half-century, it means that the water that will be upwelled in the future will become increasingly be more corrosive," Hales said. Is the Pacific Ocean's chemistry killing sea life? So what are the pH changes? Did they measure them or just the HCO3-/CO2 conc.?? Or did they even do that? Sounds to me like "OMG the oyster industry is suffering and it's due to that poison CO2, send money for further study". How can the author in good conscience omit the fact that the deep upwelling water which is supposed to contain less CO2 than future upwells will, is much higher in CO2 than current surface water because of the conditions it is was under? The oyster collapse is from the deep upwells and has nothing to do with wide-scale anthropogenic "ocean acidification" but that is what is stated at the beginning only to be back peddled to "water that will be upwelled in the future will become increasingly be more corrosive". This article can be summarized as saying that human industry destroyed the present oyster fishery--or it will have done once the effects really get built up. These people have no conscience which answers my original question. Very badly written article and very lose to non-existent science. First - the title implies that ocean acidification is caused by failed oyster larvae. Secondly, a local problem with high CO2, acidification and carbonate metabolism - which by the way is very common in areas of high runoff and pollution - doesn't prove or equate to global ocean acidification. Carbonate supersaturation and precipitation is occurring like it always has in the Bahamas - and it is just as meaningless to conclude this disproves ocean acidification as it is to suggest that local or regional shellfish problems proves it. Actually Dug, it is a very clearly written article that makes several points. If you need numbers look them up in the journal, Limnology and Oceanography. Basically the authors claim to have found that elevated seawater carbon dioxide (CO2) levels, resulting in more corrosive ocean water, inhibited the larval oysters from developing their shells"
Oyster shells are Calcium Carbonate and mixed with carbolic acids from CO2 H, so there isn't a surprise as to the damage elevate acidity could do to baby oyster seeds. Do you see where this is going. The young oyster baby seeds are apparently very sensitive to lower PH levels (acidic) and the prediction is that given global CO2 level increases this will eventually be reflected in a decreasing population of oysters.